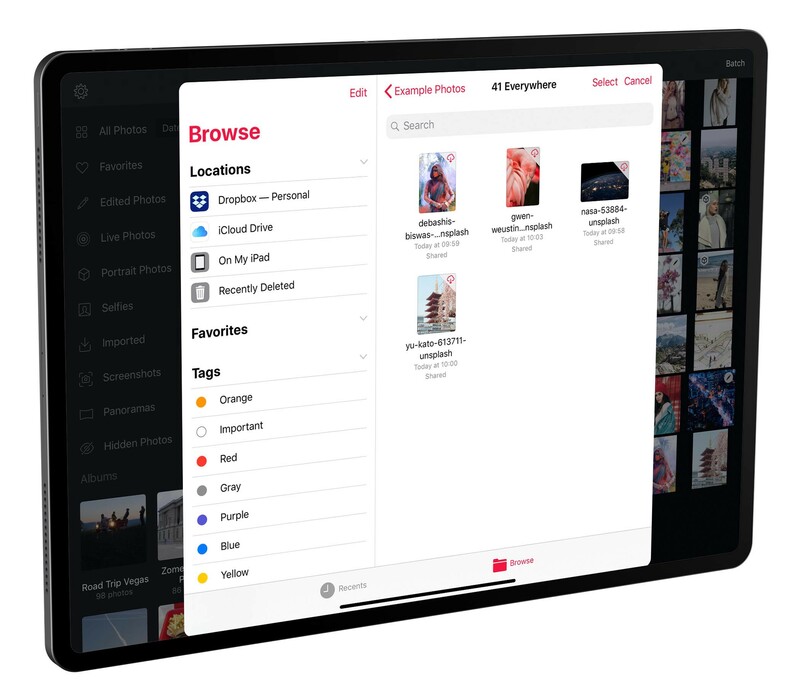 What makes Darkroom unique is our deep integration with your photo library. We don’t have a cumbersome import step, and we allow you to freely navigate your library as you edit your photos. Yet this is only valuable though if you use Darkroom as your starting point for browsing and managing photos. Important! In order for you to see and access the Photos Edit Extension, or several of the other new features below. You will have to enable them by: 1. Opening the Edit or Share Menu, and scrolling all the way to the right. 2. Tap the “More” button. 3. In the list that comes up to turn on Darkroom. 4. Finally, re-order the list to make Darkroom accessible as one of the first in the list. Drag & Drop on iPad is one of those feature you just have to try for yourself to see how cool and useful it is. 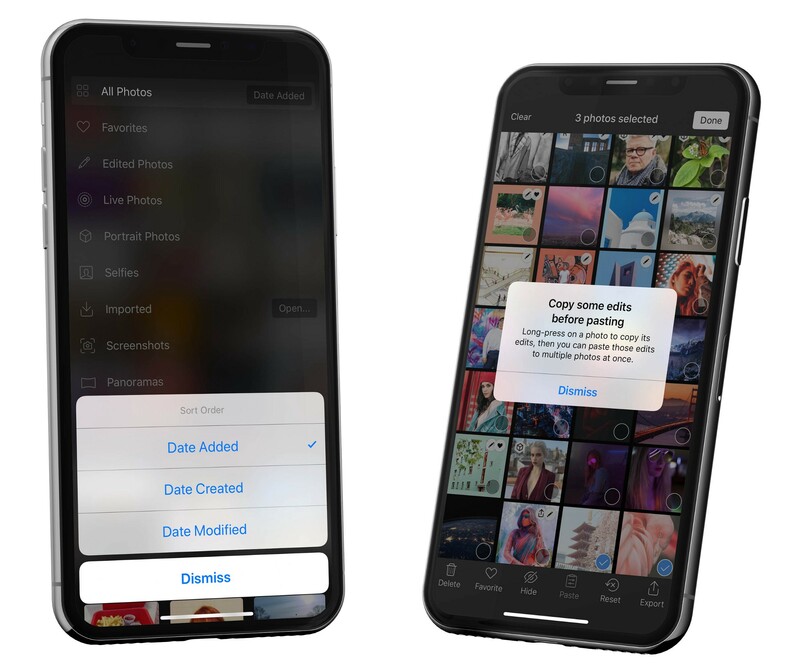 Now photos can be directly dragged and dropped onto the Darkroom library to be imported to your photo library and an editing session will be started. Try it with multiple photos! After you start dragging one photo, use other finger(s) to tap on other images. Pro Tip: You can combine iPad Drag & Drop with other apps that also support split-screen multitasking. Try Cascable to import images directly from your DSLR to Darkroom. Whoosh! 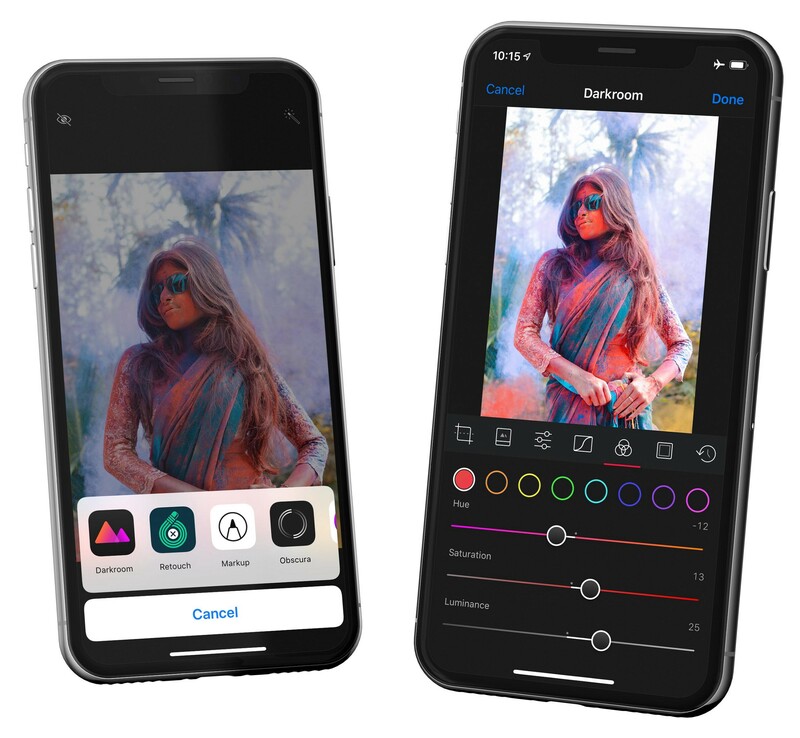 If you’re in the Photos app and want the full power of Darkroom to edit a photo you’re looking at, we added a new Share Extension which allows you to tap Edit in Darkroom to hand over your photos from the Photos directly to Darkroom for convenient editing, without creating duplicates! If you are deep in an app like Dropbox or the Files apps looking for a photo, you can now easily import that photo to your library and edit it in Darkroom using the new Copy to Darkroom button right from the share sheet. With all these photos coming into Darkroom from many different places, we thought it would be useful to provide one convenient place to track all the photos you imported and/or copied into Darkroom. The new Imported smart album in the album picker will include these photos in the order that you imported them. This addition has to be one of the most frequently requested changes (Apart from Photos Edit Extension). Now the All Photos smart album is sorted by Date Added by default, just like in the Photos app. We have also added a button that allows you to switch to Date Modified and Date Created. We have also decided to remove the “Hide Screenshots” setting. All your Screenshots are now neatly tucked into the Screenshots smart album in the album picker. With the release of iPad support we saw a significant uptick in the use of, and feedback on our Batch tool. As a result we have made several improvements to make the tool more intuitive. 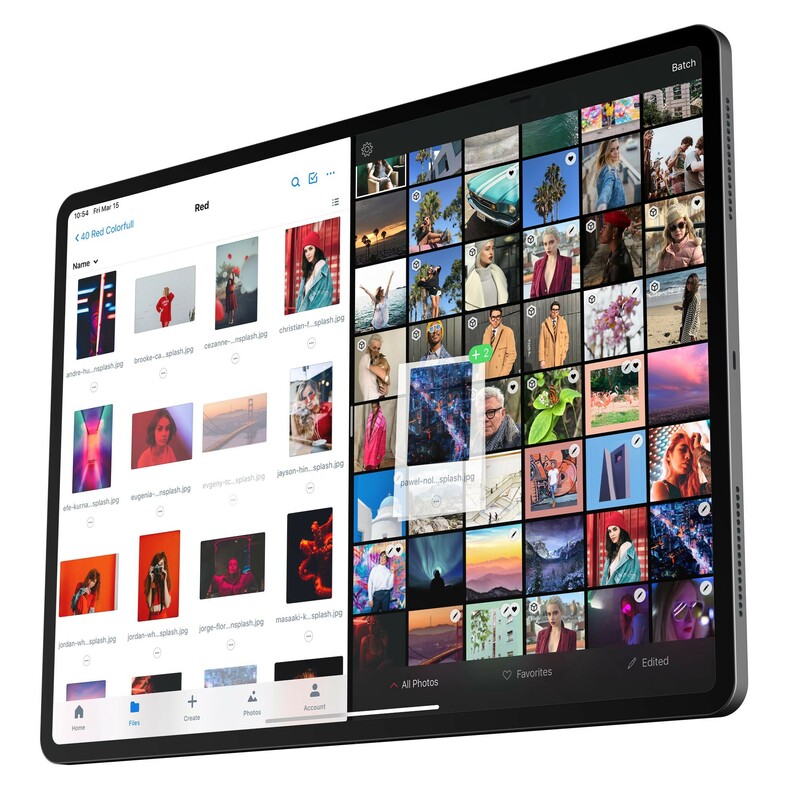 The gestures are now simpler, just swipe left or right to start selecting a range of photos and we’ll even scroll along if you drag the selection up and down. The buttons now have labels for clarity, and we gave the Done button more visual prominence. As a side-benefit to all this, we’ve added the ability to tap-and-hold to get the action menu of a photo while in batch mode, which allows you to copy edits and paste them in-place. We spent a lot of time improving the layout code and the animations & responsiveness of the app so that as you rotate/resize the app, it should be much more stable and less likely to break. As a final note, a big big Thank You to Ashley for building the Photos Edit Extension and helping us make this release amazing. Couldn’t have done it without you!